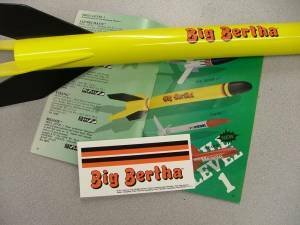 Comments: Before the Big Bertha was first offered as a kit in 1965, Estes Industries published Rocket Plan No. 13, which is the original Big Bertha. The original BNC-60L was not a simple ellipsoid, but was pointier. I still had a rounded tip. A good picture of how it looked appears in the 1964 Estes catalog. Other major differences between the original and modern Big Bertha are the 3/32" thick fins and shorter motor mount with an engine block and no hook.